Saturday’s forecast was not great for wind, if the webcam had been working you would have noticed that the forecast was correct!! The lake was mirror like most of the afternoon. Racing was postponed until 1030hrs on Sunday. It was due to be a lot more overcast, but there with a reasonable breeze. Sunday’s earlier than usual start enabled the F15 fleet to get their first race in before club racing started at 1130hrs. As forecast, the day was overcast but there was a SW breeze. Although the OD assures us there was a beat in the first race, using the same beat for the second race failed miserably! The lack of a beat for club racing kept the fleets together (handicap wise) and it depended where you were, at what stage, as to whether you were in a position to take advantage of the various gusts that came through, and strengthened as the race went on. 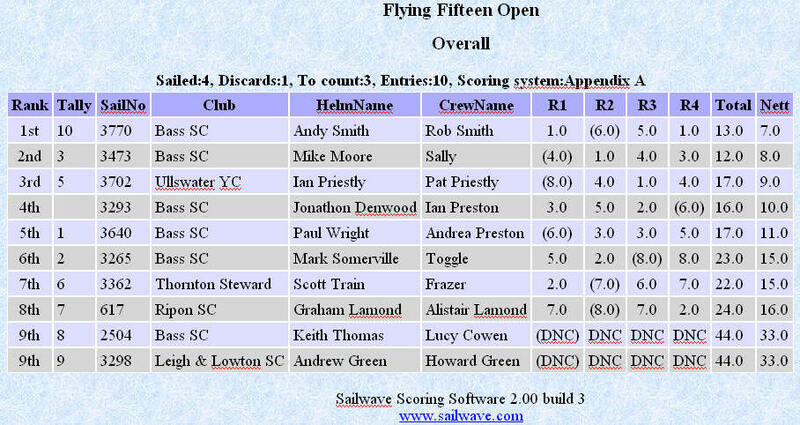 After two races, and despite mixed fortunes, Mike Moore and Sally were in the lead in the FF open at the lunch break during which drizzle moved in. Would that kill the wind? Well, effectively it did! The afternoon racing was held in light airs, with a quite a mix of the leading lights such that only 4 points split the top half of the fleet. It was Andy and Rob Smith that came out on top, beating Mike Moore by a point. Andy’s team mate for the series was Ian and Pat Priestly from Ullswater, who by securing third overall ensured that they won the team racing part of the event.